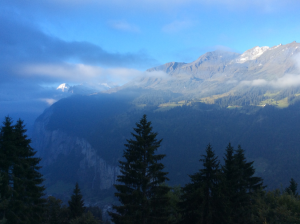 What a sunrise in Wengen! After only a few hours’ sleep, here I am waiting for sunrise and for the view outside our window to open its delights for me. Already I can see the mist tumbling down the sides of the ravine like an amazing waterfall. It looks as if it should be a nice day but I stuck my head out onto the balcony about an hour ago and it is icy cold – we are on a train holiday in the Alps after all!